Those of you that are from Austin are well acquainted with all the wonder that can be wrapped in a tortilla. I can’t tell you how many times we’ve been rescued by tacos. These little guys turned what was going to be a very sad meal into something that filled the belly and made our tastebuds happy. 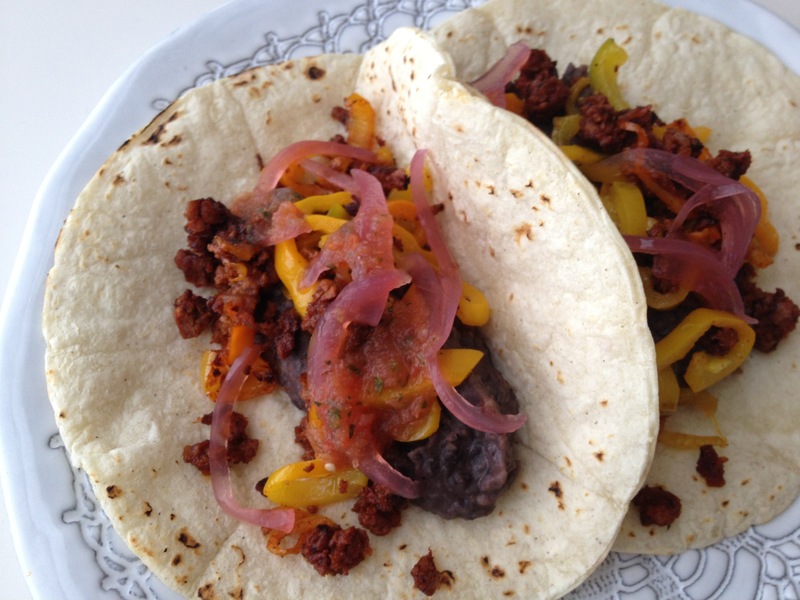 Our Black Bean & Sweet Pepper Tacos consist of pureed black beans, sauteed mixed peppers, soyrizo, pickled red onions and salsa casera wrapped in corn tortillas. This meal can go from quick lunch to full dinner with the addition of a couple of veggies sides – oven roasted sweet potatoes or a simple salad of cukes and avocado dressed in a little salt, pepper and lime would do the trick. we keep pureed black beans and pickled red onions stocked in the fridge, so that helps… lots. Yum!! That looks amazing, and it’s awesome that you were able to just throw it together.